By Jeffrey KaczmarczykWhen Native Americans allied with the British during the War of 1812, Nawquageezhig of the Potawatomi people fought alongside the great Shawnee Chief Tecumseh. Years later, Nawquageezhgig led his people to live among the Grand River Ottawa peoples. When traders and settlers began arriving in Grand Rapids, the American Indian leader was among those who welcomed them. "He knew that wealth would come this way for his people," said sculptor Antonio Tobias Mendez. Chief Noonday, as he was called by English-speaking settlers, will be commemorated in a bronze statue to be installed downtown near the west bank of the Grand River. Sculptor Antonio Tobias Mendez has been commissioned to create the sculpture as part of the Community Legends Project. 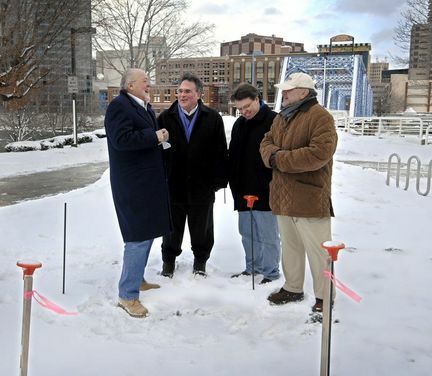 The project, initiated by philanthropist Peter Secchia, is a long-term effort to place downtown 25 sculptures of important figures in the history of Grand Rapids.Comment: No picture of Chief Noonday exists, so the sculptor is researching the "clothing, customs, and regalia of the Ottawa people." Compare that to the approach taken by Cyrus Dallin for his sculpture of Massasoit: making up the chief's appearance based on stereotypes. This is the approach validated by Utah's art historians, who don't see anything wrong with Dallin's statue.